Those who have been trying all these years to get rid of their spare tires (protruding bellies), read on. Actress and health buff Jackie Lou Blanco leads the roster of speakers to the So Easy Colon Cleanse Life Camp that will be held on February 19 at the St. Giles Hotel along Makati Avenue (Makati City). She will be joined by a respected Filipino oncologist and US- and Malaysian-registered dietitians/nutritionists, image and weight consultants who are leading proponents on the prevention, diagnosis and management of life-threatening diseases, in particular colon cancer. They are all one in saying that what lie inside your fat stomachs are not just fatty foods but hardened stool that have been inside your colon for years. According to world statistics, 90 percent of diseases are caused by an unhealthy colon. An unhealthy colon always leads to major digestive orders which affect people of any age and will happen more frequently as they grow older. Worse, it causes colon cancer, the worldâ€™s third leading cause of death and sixth in the Philippines. But the good news is, 30 percent of diseases are preventable, according to the World Health Organization. Anyone can register for the one-day So Easy Life Camp, health enthusiasts and especially people who are overweight, constipated, meat eaters, have a history of colon cancer and other types of cancer, suffer from skin problems, aged 30 and up who have never undergone colon cleansing yet. Up for discussion are Losing weight and maintaining it at healthy levels by Jackie Lou and US-registered dietitian Cheshire Que, Preventing cancer and colon cleansing by Dr. Anthony Abad, Carrying with aplomb your new (lean) look by image consultant Malu Galang, and the Power of the colon-cleansing product â€˜So Easy Colon Cleanseâ€™ with wheatgrass by Malaysia-registered dietitian/nutritionist and book author Penny Chong. The So Easy Colon Cleanse infomercial is showing on Cable TV in 14 cities across the country. In Metro Manila, it is screened daily on SkyCable 11 and Destiny Cable 3, 10pm â€“ 12 midnight. 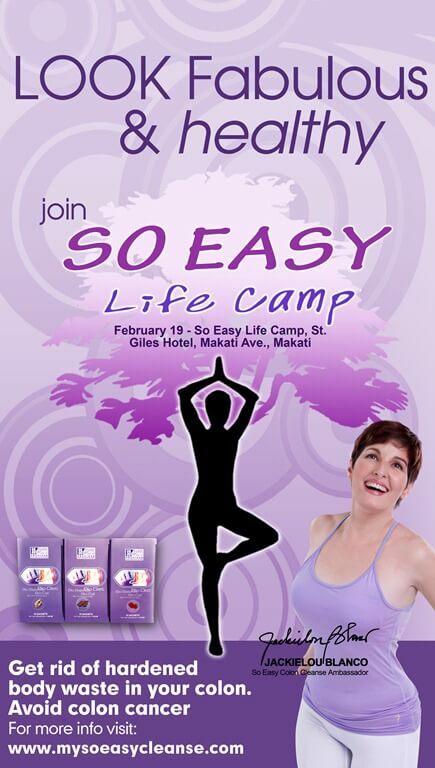 For more information about the Life Camp, interested parties can call Easy Pha-max Philippines at 890-EASY (3279) or visit www.mysoeasycleanse.com. Exercise. I missed doing that today. I got too busy. Arrrgh!